Brooklyn's grandest public space at the top of Prospect Park has always been a work in progress. Grand Army Plaza, an oval-shaped public space composed of monuments ringed by an inner and an outer roadway, was built as the main entrance to the park in 1866, serving as a buffer between nature and city and happened to be the confluence of some of Brooklyn's busiest avenues. Over the years, a monumental archway was added, fountains came and went, and eventually the roads were widened until the lush plaza was effectively cut off from the surrounding Prospect Heights and Park Slope neighborhoods. Last week, however, after months of construction to tame the out-of-control roadways, a group of civic leaders and officials gathered in what was once a busy street to celebrate the newly reclaimed plaza. NYC DOT commissioner Janette Sadik-Khan praised the transformation of the intersection into a real multi-modal space. She said the changes to Grand Army Plaza are "an incredible invitation into the plaza to appreciate a landmark in a new way." The transformation is not just a boon for pedestrians and cyclists, she continued, but for motorists as well, noting that automobile behaviors have been streamlined and simplified through the oval by new medians and pedestrian islands to reduce merging conflicts. Similar to interventions across the city that shave off unused or excess pavement from roadways to be reallocated to pedestrians, the NYC Department of Transportation has created 71,000 square feet—or about 1.5 acres—of new pedestrian space at Grand Army Plaza. New landscaped pedestrian islands at the plaza's north side (above) help to route traffic more efficiently while shortening the distance pedestrians must cross to get to the park. At the south side (below), a vast swath of asphalt between the Soldier's and Sailor's Arch and the rest of the plaza has been paved with a light-colored gravel and lined with white granite boulders to officially keep traffic out. A similar treatment was put in place at the gates of Prospect Park where weekend Greenmarkets traditionally take place. New pedestrian islands, a large new crosswalk leading directly into the park, and a dedicated bike lane folllowing the Plaza Street loop complete the picture. Grand Army Plaza has been notoriously dangerous. In the late 1920s the plaza featured a large billboard called the "Death-o-Meter" (below) displaying the traffic injuries and fatalities in Brooklyn to promote safer driving in the area. 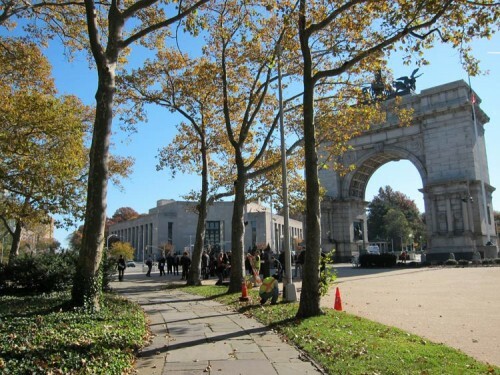 Grassroots efforts to transform Grand Army Plaza into a pedestrian-friendly environment began in 2006 with the formation of the Grand Army Plaza Coalition (GAPCo) comprised of concerned citizens and organizations including the Project for Public Spaces. The coalition gathered widespread community input on how to improve the space producing a design by architect Jan Gehl in 2006 and eventually working with DOT to make their plans reality. In 2008, a design competition with the Design Trust for Public Space garnered inspiring proposals on how to rethink the urban tangle, with most results calling for a radical overhaul of the traffic circle. Plans were finalized during the contentious battle over the nearby Prospect Park West bike lane, but Sadik-Khan told AN the controversy did not affect the designs at Grand Army Plaza. Still, one component—a two-directional protected bike lane along Plaza Street, which creates the outer oval, that was approved in 2010 by community boards 6 and 8—was withheld from plans presented the spring. StreetsBlog pointed out at the time that the lane wasn't fully eliminated, but delayed after some residents were concerned about traffic. "I'm happy with the way the project evolved," said Sadik-Khan. "Adding 1.5 acres of new public space at the crossroads of Brooklyn is an incredible asset." "Over the past 50 years, the plaza has tipped to more street. We tipped it back to pedestrians," said Robert Witherwax, coordinator of GAPCo. 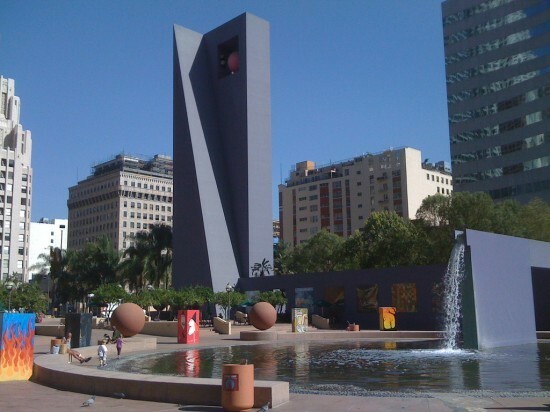 "In terms of getting pedestrians into the plaza, it's genius, simple, elegant, and it works." The changes represent NYCDOT's budget approach to creating new public space quickly. A coat of gravel and paint is much more affordable than a completely new streetscape and can be fulfilled much faster. Witherwax said the next step is to program the new space, which could include new events and outfitting the plaza with furniture. "We have a treasury of ideas," he said. "We're making a part of the park useful that wasn't before."